Would you like to study in Germany? 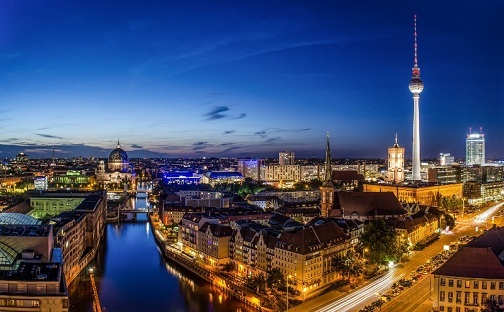 Germany, the largest economy in the European Union and third in the world, is home to some of the most renowned researchers of the history, like Albert Einstein, Max Planck or Alexander von Humboldt, just to mention a few of them. Germany is also a highly popular educational destination among students from other states of the European Union as well as from outside Europe. In 2009, over 250000 international students chose to study in Germany. That's above 10% of all the student population atGerman higher education institutions! Whether you plan to study in Germany as an exchange student, free mover or a full degree student, you will benefit from low tuition fees and the world-known quality of the higher education in Germany. And, what's your reason to study in Germany? Studying Abroad in Germany is a big chance not only for European people but for students from all over the world. They benefit from a high quality educational system, learn a new language and gain experience from this interesting country. It doesn’t matter if one is spending his whole studies in Germany or is just interested in a term abroad; these pages provide the necessary information about all relevant topics. German universities have a quite good network with universities all over the world. Every year thousands of students have the opportunity to go abroad and spend some time in a different country, studying and living. This should be the same way for international students. Because of this, German universities and technical colleges try to provide enough university places for international students and they also make efforts to support them in many other questions concerning the time abroad. But what is it that makes Germany that special and what can it offer to the students from all over the world? The Federal Republic of Germany proportionally is a quite small country but its history as well as its actual role in the world is something special. It is not only in Europe that Germany has an important position but it is also an important international trading partner and player, concerning political and economic questions. German employees from different fields and disciplines are in great demand all over the world and have realistic chances to get a job in an international company in many different countries. Germany itself is also a good and attractive country to work there later. The universities and the obtained graduate degree are well-known all over the world and show the future employer that the student had a firm basic education and also got further knowledge. At German universities the practical part of the studies has an important part to play. Internships have to be done in many programs of study and every professor recommends doing one. The big industry and especially the large cities provide many opportunities for these internships. One can absolve them in the most different kinds of disciplines and companies. Depending on which area in Germany one decides to study, there are numerous activities and journeys to do and go in the free time or on holidays. During this traveling one can see the different areas of the country and all its faces. With more time and a larger amount of money one can also start travelling Europe from Germany. The country gives the perfect start for this trip and one is able to see a lot of countries during the time abroad. In Germany there are the sea and beaches of the Nord- and Ostsee, cultural and historic interesting towns or buildings and winter sports areas in the south. There will definitely be no boring time during the studies in Germany. Studying in Germany has changed during the process of Bologna and the changes resulted in the Bachelor and Master system. The first graduate degree obtained is called Bachelor. After this there is the possibility to continue with a deepening or additional Master program. Both are independent and accepted graduates. The large focus on research projects is also a reason for the good reputation of German universities. The state provides money for the research projects and this enables the student to do their own projects and learn in an actual real-life situation. The study programs are furthermore considered as more difficult than the ones in other countries but this has a positive impact on the reputation. With a semester abroad or a German graduate degree one has a very good chance for the future and with some more own initiative one can work all over the world. Furthermore, studying in Germany not only provides interesting topics but also numerous free time activities and many travel opportunities. It is really worth, getting to know this country in the heart of Europe. The educational system of Germany is underlying to continuous changes and reforms. Main point in the last years was the reorganization of the Gymnasium. The nine year education was changed into an eight year education to get the Abitur. Furthermore, the academic system had changed because of the Bologna reform. The degrees obtained are now called Bachelor and Master. Studying in Germany requires the graduate degree Abitur or the advanced technical college entrance qualification. International students have to show a similar graduate degree. Until now it was not possible to build a central organization for application and award of university places. Because of this the applications still need to be sent to every university or advanced technical college. The admission requirements are also defined by the universities. Therefore, they can be different for the same subjects at different universities. In Germany there are three different kinds of advanced colleges or universities. Arts, film or music advanced colleges offer practical education in the artistic subjects. Advanced technical colleges however, cover the scientific and social subjects. They also set value on practical experiences in their education. The third category is the so called university. They offer all different kinds of subjects. Practical experience is an important point as well but the universities are especially famous for their firm theoretical education. Another differentiation can be made between public and private universities. Public universities are financed by the government and do not charge tuition fees as of October 2014 in the entire country. Private universities in contrast are financed by the fees paid by students and these can be quite expensive. In Germany can be found much more public universities than there are private ones. German law says that education should be offered to everyone and everyone should be able to afford adequate education. Therefore, German has decided to abolish tuition fees in all public universities in the country. Moreover, there are numerous possibilities to get help from the government, for example Bafög-money. The studies in Germany are in some aspects more theoretical than in other countries and they consist of many lectures from the professor. In the lecture there are all students of one year and there are just a few exercise lessons in which the theoretical part can be practiced and proofed in reality. At the end of every term the students get grades for their final examination and for speeches, assignments and practical projects. Depending on the subject the composition of these parts can differ. Practical education can also be offered in internships which are an obligation in some subjects. For some weeks or months the students have to work in a company and use their theoretical knowledge in real life situations to gain experience. This is also a good chance to find a job for the working life after university. The graduate degrees from university are accepted and estimated worldwide. The education at German universities is considered as a good one. The first graduate degree can be obtained after six to eight terms and is called Bachelor. Afterwards it is followed by the Master degree after another two to four terms. Both degrees require passing the exams and writing a specific graduate thesis. For the subjects medicine, dentistry, law and pharmaceutics as well as the teaching degree another degree is required which is called Staatsexamen. After the Master degree students can also do their graduation to get their doctor’s degree. Academic education in Germany should give firm basic knowledge and theoretical background as well as specific details and practical application. After successful studies the alumni should be able to work successful in every part of the working environment.